Flat Breast, hollow cheeks and unattractive curves are no more a problem. Overcome thin and pale look with more vigour energy and ample figure. Pancha Jeeraka Gudam the age-old formula for women. Along with the benefit of 'Milk 'n' Ghee, 18 time tested herbal ingredients makes it an essential health supplement for today's women. Maruthua with 25 years experience of ayurveda brings you Maruthua Panchajeeraka Gudam. It has milk and ghee along with 18 trusted ingredients which makes it an essential everyday health supplement for women of all ages. The best food may not correct the hollow cheeks, flat breasts and unattractive curves. Women need not worry as she can walk into the world of beauty boldly. It is particularly effective for women in pregnancy period and it helps women preparing for pregnancy. 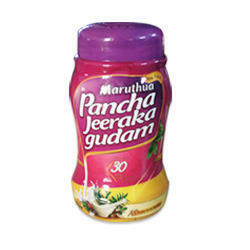 Pancha Jeeraka Gudam effectively cures gastric and vaginal ailments. It is a complete health tonic appropriate for pre-natal, post-natal periods. Quite effective in breast feeding mothers. Usage: A table, spoon full of Maruthua Panch Jeeraka Gudam after breakfast and dinner gives the full result. We as a company came in existence in the year 2009, as a partnership firm. Commerce India has grown as a company and helped the industry realize our potential. We are Wholesale Merchants of branded Herbal Health Care Products. Our range includes Hair Care Herbals, Skin Care Herbals, Body Care Herbals, Women Care Herbals, Natural Herbs, Men Care Herbals, Baby Care Herbal Products, Oral Care Herbals, Homeopathy, Ayurvedic Products and many more for all health related problems with natural cure. We also export Quality Branded Cosmetics & Beauty Care Products. From strength to strength we have posted our success stories; thereby we introduce ourselves as one of the best known trader, supplier & distributor of herbal health care products, baby care herbal products, hair, care herbal products, cosmetic products, herbal weight loss products and more. This wide assortment of product range has helped us to identify newer markets and expand our reach. Owing to our line of business, we have a large pool of vendors. This large base helps us to work on mass scale and execute bigger orders with relative ease.? While creating our vendor base, we evaluate them on various parameters like, market readiness, knowledge base, quality assurance, and infrastructural set up etc. We not only maintain the quality at our end, but the vendors who work with us are aligned with the same set of standards. Right from procurement of the raw materials from the vendors till the time final product is given go head, we aspire for highest level of quality.